The Environment Agency is holding a public drop-in at Calstock to explain how potential works could reduce flood risk to local homes and businesses, and benefit the environment. The Environment Agency is keen to learn from local people who are invited to attend to share their views to help shape our proposals. It is our job to reduce flood risk to people and properties. 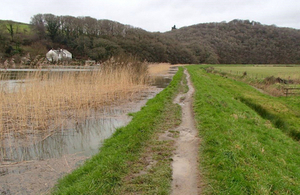 We are looking at ways to improve the existing flood defence embankment in Calstock. By moving it inland we can increase its effectiveness at reducing flood risk and allow the creation of inter-tidal habitat to help offset the impacts of rising sea levels on wildlife. We welcome views from the residents of Calstock so that we can design a scheme that the local community is happy with. The drop-in session for people to learn more and share ideas will take place in the Kelly Room of Calstock Arts on Wednesday 8 November 2017, from 3pm to 8pm.